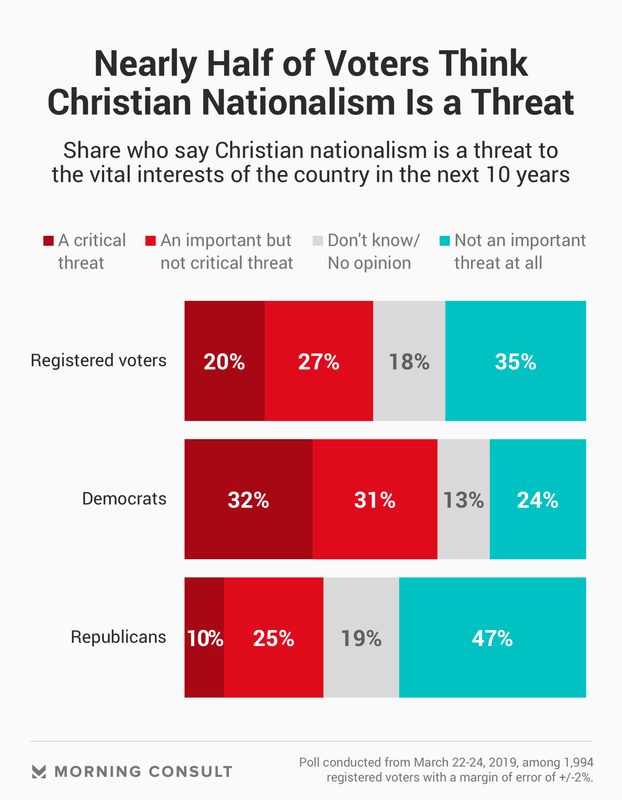 Roughly half of Republicans (47%) and white evangelicals (46%) say it’s not an important threat at all. As 2016’s election wound down, political scientists scrambled to understand which issue pushed President Donald Trump over the finish line. And while research showed economic dissatisfaction and prejudice toward immigrants and minorities to be a strong indicator of support for Trump, one study found that the best way to determine vote choice in 2016 was by gauging adherence to Christian nationalist ideology. “Christian nationalism,” or the belief that the country is or should be a Christian nation that can often include social and political campaigns supposedly aimed at maintaining or reverting back to that status, is not a new phenomenon, but the fervor among its adherents grows stronger amid the United States’ shift toward a more diverse and secular country. A March 22-24 Morning Consult poll finds that nearly half of the voting public views that ideology as an important or critical threat to the vital interests of the country within the next 10 years. Christian nationalism doesn’t strike the same level of concern among voters as white nationalism, a movement that has received increased media attention in the wake of tragedies such as last month’s mass shootings in Christchurch, New Zealand, and 2017’s Charlottesville riots and protests: White nationalism is viewed as a critical or important threat by 64 percent of the electorate. Christians in the United States, particularly white Christians, have faced declining numbers over the past few decades, just recently losing their status as a majority. Between 1996 and 2016, the share of the public who identified as white Christian dropped from 65 percent to 43 percent, according to public opinion shop PRRI. Scholars say that white Christians have lost their perceived standing as the country’s decision-makers amid their declining status, bolstering this form of nationalism. In a study published in 2018, Whitehead and others found that those who showed affinity toward attributes listed on the “Christian nationalist index” — such as declaring the country a Christian nation and allowing prayer in public schools — were overwhelmingly more likely to vote for Trump than for Democratic candidate Hillary Clinton. Many of those backing Trump were white evangelicals: Exit polls showed 8 in 10 voted for him in 2016. A key part of the Republican base, white evangelicals are significantly more concerned about illegal immigration than Christian nationalism, according to the Morning Consult survey, which was conducted among 1,994 registered voters with a margin of error of 2 percentage points. 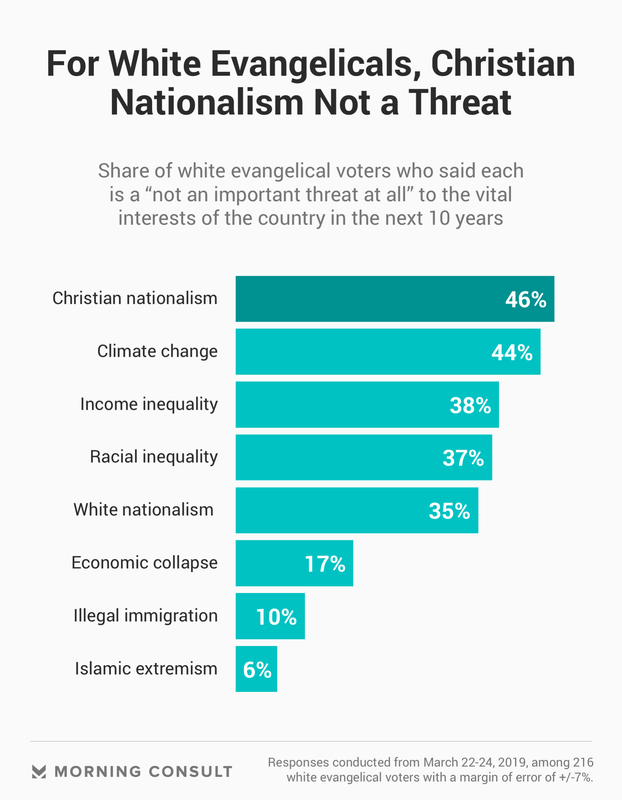 Nearly half of white evangelicals said Christian nationalism is not an important threat at all, roughly on par with their lack of concern about climate change. Whitehead said Trump’s pitch as the final line of defense for the country’s perceived Christian heritage will play an equal if not larger role on the road to 2020. That includes championing so-called “religious freedom,” which often prioritizes Christian values over those of other religions.